Stackable initial and birthstone rings for the mother of two. This set comes with two birthstone rings and two initial rings to proudly wear stacked together. 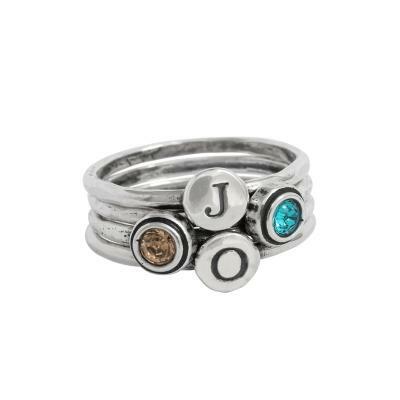 Stackable initial and birthstones ring set for a mother of two. Comes with two initial rings and two birthstone rings. Stack them up and a wear them to represent your two kiddos. Makes a wonderful present for a mom having her second child. All rings are sterling silver. Rings available in all letters, the "&", heart, cross, plus all the birthstone colors. Please note: Stacking four or more rings will make the total width wider, which will make for a snug fit on your finger so please take that into account and consider ordering a larger size if you plan on stacking 4 or more of these bands. What Nelle & Lizzy does to create an heirloom piece?